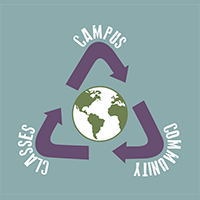 We meet every other Wednesday at 3 p.m. in the Sustainability Center, A248. If you can’t make meetings, join our mailing list to stay aware of what is going on with us. Email sustainability@mchenry.edu! In 1994, the Lou Marchi Total Recycling Institute (LMTRI) was established through an endowment by a former continuing education instructor and community leader for environmental issues, to promote recycling in the community. The LMTRI has helped establish used paint and athletic shoes recycling programs; co-sponsored electronic and hazardous waste collection events; assisted with green business programming; and hosted Earth Day events and a variety of environmental programs. LMTRI has also published recycling directories with over 45,000 copies distributed through the Northwest Herald and eighty county locations. The Marchi’s vision was for the Institute to provide programming that wouldpromote reducing, reusing and recycling in an effort to reach the goal of zero waste. In 2013, the Sustainability Center was created at MCC. The Center (see tab) focuses on three areas: green campus, green curriculum and green community. The Green Community initiatives include the development and publication of the annual Green Guide Recycling Directory under the direction of the Marchi Fund Advisory Committee. This committee meets three times a year. The Lou Marchi Total Recycling Institute no longer exists as the work has now been infused into the work of the MCC Sustainability Center. MCC is grateful to Lou and Margaret Marchi for their commitment to recycling in and around McHenry County. The MCC Marchi Fund Advisory Committee meets regularly to guide the work of the Institute.